Here at NYCTaper we’ve been big fans of the Northside Festival, and L Magazine and indeed the Stedmans for quite a while. And we hope the feelings are mutual — we’ve hosted multiple Northside showcases over the years and have been the subject of several L Magazine profiles too. But the show that seems to have been the pinnacle for the Fest has also been one of our favorites and that’s the Saturday afternoon mega-show at McCarren Park. In previous years we captured the uber Guided By Voices event in 2011. But this year it was a whole other level — one of the best live bands in the world playing in the bright sunshine in front of a few thousand adoring fans. 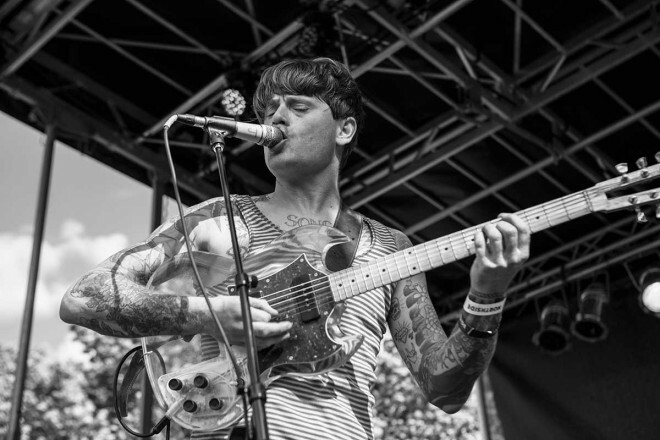 Thee Oh Sees return to NYC after a brief “hiatus” was met with quite a bit of enthusiasm — by the time the band began their set much of the huge McCarren yard was filled. Indeed, John Dwyer joked that the next night’s show at Death By Audio would have a capacity one-fourteenth the size of this day’s crowd. After an introduction by Daniel Stedman, the band ripped through more than an hour of their intense garage-rock before the show’s curfew called an end to the set. We’ve previously discussed Dwyer’s move of the band to a trio but on the big stage in a huge venue, the three oh sees had no problem filling up the sound. As John announced, they’ll return to NYC in November and we’ll certainly be there again. I recorded this set with the Neumann wide cards set up in front of the soundboard tent about 80 feet from the stage and mixed with a fine stereo board feed. The problem on this day was the wind. It was blowing and bursting right into the face of the stage, so that there is phasing that’s present in the board feed through the mics on stage and also in the sound projected by the speakers. There is no wind noise problem in the mics because of was in front of the tent, and protected by both the mic grills and big windscreens. Other than the wind-phasing, this is an excellent recording. Enjoy! Download the Complete Show in both FLAC and MP3 by utilizing our Personalized WeTranfer Page [HERE]. We are very pleased to be able to partner with WeTransfer to offer direct downloads at NYCTaper without the limitations of our server speeds and without the limitations of other download services. WeTransfer offers our readers unlimited downloads at excellent speeds. This is a partnership that we believe will benefit the site and our readers and we’re quite pleased to be working with WeTranfer. If you download this recording from NYCTaper, we expect that you will PLEASE SUPPORT Thee Oh Sees, visit their website, and purchase their official releases from Castle Face Records [HERE].